Chef and TV host Christine Tizzard knows that for all the things you can't control in this world, what you put on the table is entirely up to you. 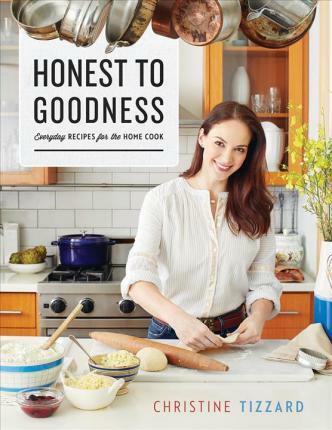 In Honest to Goodness she showcases years of experience preparing food in front of and behind a camera, sharing more than 150 nutritious, stress-free and flavorful recipes that will have your family savoring every bite. It can be hard to keep up with food trends, and Honest to Goodness surveys the endless fads and fixations to discover what's best for you and your family. With an emphasis on raw ingredients and whole foods, Christine shows you how to prepare accessible meals from scratch, utilizing the healthiest and most beneficial properties of everything you touch without skimping on taste or getting lost in culinary crazes. Learn everyday staples like Homemade Hot Sauce or Gluten-Free All Purpose Flour, then add them to breakfasts, lunches and dinners that are quick to prepare and delicious to eat. Enjoy preparing foods that serve everyday needs without feeling ordinary, like Spatchcock Piri Piri Chicken or Sweet and Spicy Spaghetti Squash with Sorghum. Sample enough bake sale recipes to get you through the year - from Zucchini Oatmeal Chocolate Chip Cookies to Oh My Gluten-Free Brownies - and let Christine show you how to prepare packed lunches your kids will want to show off: Kid-Friendly Quinoa Tabouli, Black Forest Grilled Cheese in a Bagel - even sushi.